Never Enough Nails: The Ultamate Holiday Polish Look!! EK (former co-author of this blog) and I wandered into Ulta "on our way home" yesterday, and lo and behold, they had the China Glaze Ulta Exclusives!! They were also having a Buy 2, Get One Free on all China Glaze polish, so naturally, we knew what had to be done. We each bought both of the Ulta exclusives. I couldn't wait to try them out! 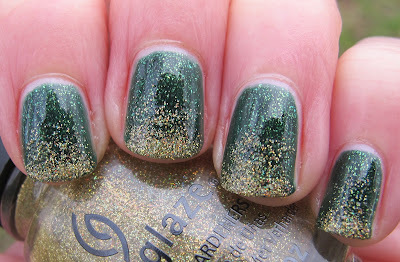 I also had yet to try China Glaze Glittering Garland, and so, an idea was born!! 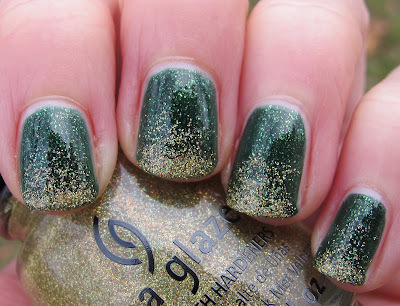 The drool-worthy combination you see here is two coats of China Glaze Glittering Garland with China Glaze Ultamate Holiday sponged on the tips. Ultamate Holiday is AMAZING!!! It's a very fine glitter polish with gold holographic glitter! 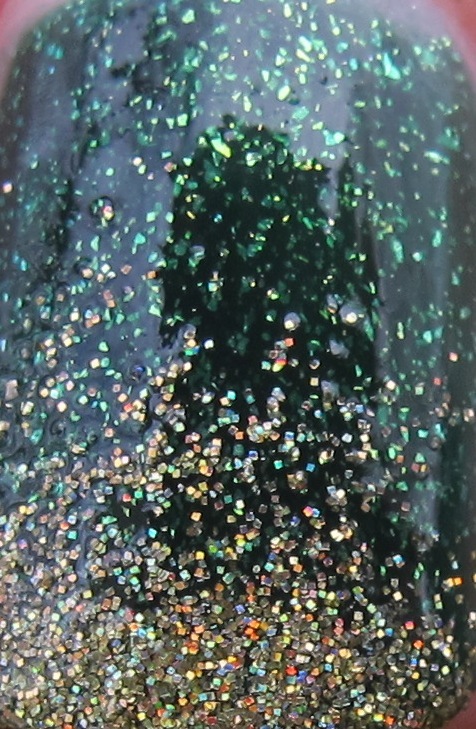 It is easily full-coverage and the glitter is that super fine sugary texture that I love. Ultamate Holiday kind of reminds me of my favorite China Glaze Medallion, if the large pieces of glitter in Medallion were crushed up into tiny bits. 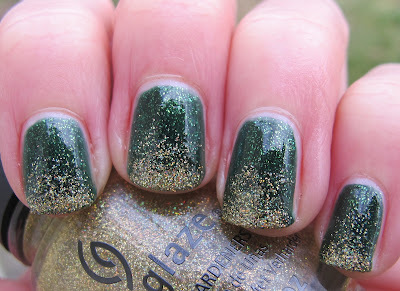 Any self-respecting nail polish/glitter/China Glaze lover NEEDS Ultamate Holiday. I am declaring it a Never Enough Nails Necessity. It is a gorgeous shade of yellow gold and is also holographic. 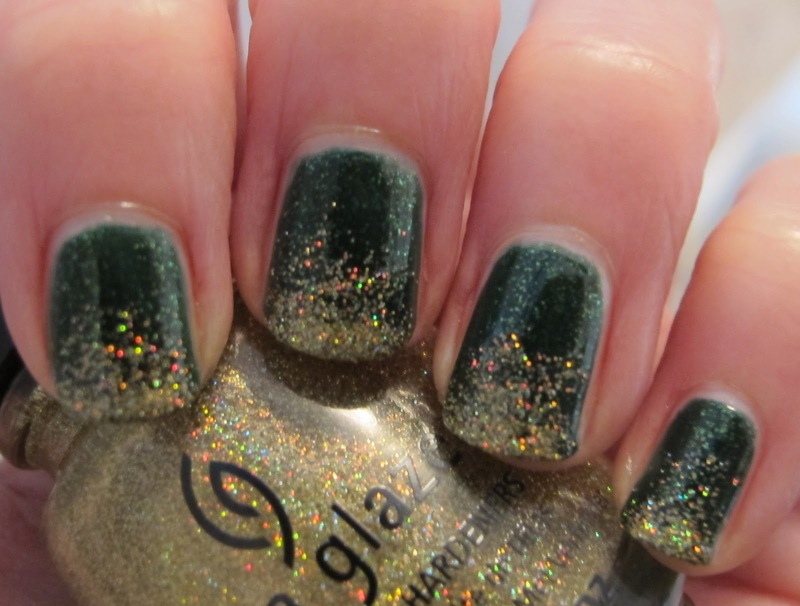 The holo is not as strong as some polishes, but it is definitely there, and eye-catchingly gorgeous. I took a blurry picture so you could see the holo-ness better! Not too shabby, right? 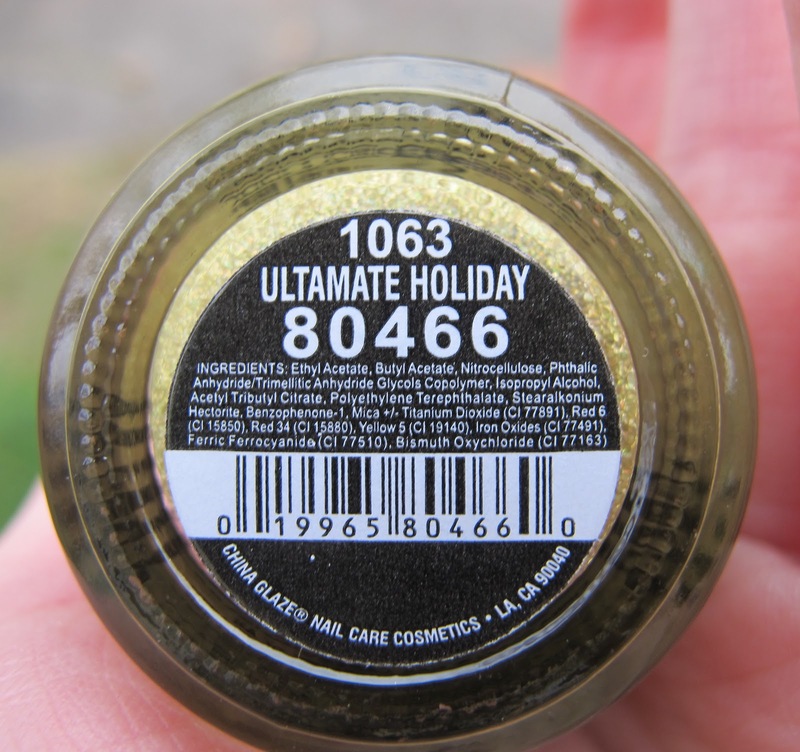 Ugh, I love this combination and I REALLY love Ultamate Holiday. Ek and I actually debated buying this in the store, can you believe that? It didn't look as awesome in the bottle as it does on the nail. 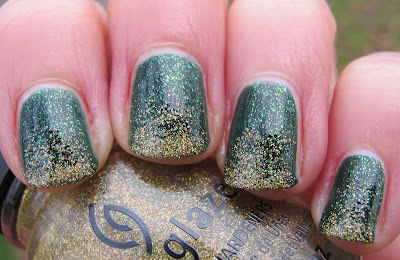 China Glaze Glittering Garland is pretty cool by itself too. A green jelly-ish polish filled with small uneven sized glitter pieces. 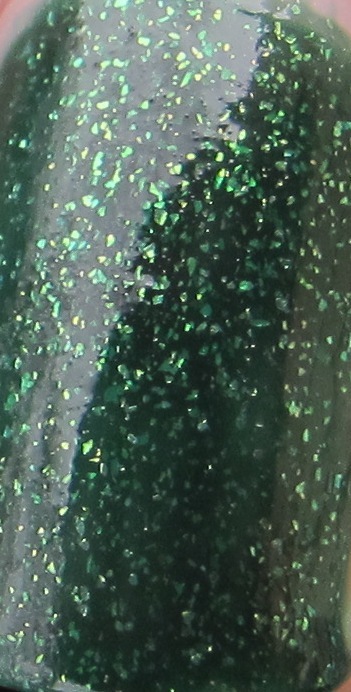 I can't tell what color the glitter is. Light green? Gold? I don't know, but it looks fabulous on the nail. This is two coats and the formula was fabulous. I am really impressed with all of the China Glaze Let It Snow polishes I have. I've gotten away from CG lately, but I think they are back with a bang now!! If you want to see China Glaze Ultamate Holiday alone (who doesn't? ), I will have swatches of it and the other Ulta Exclusive, Fireside Glow, very soon. Unfortunately, the Ulta exclusives are no longer available on Ulta.com, so you will have to go hunt Ultamate Holiday down at an Ulta near you. But really, I recommend getting the two Ulta exclusives and then getting Glittering Garland as your freebie, because they make a wonderful combination!! Thanks OPI Addict! I can't stop staring at it! I just did a similar look to this yesterday.. I say similar..lol its a little different ! 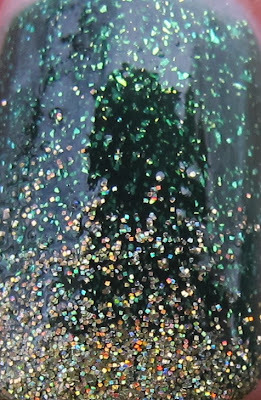 Short & Sassy for my base, Emerald Sparkle sponged on the tip, and silver glitter nail polish sponged on the Emerald Sparkle ! AdmiralBiatch- oooooh that sounds amazing! 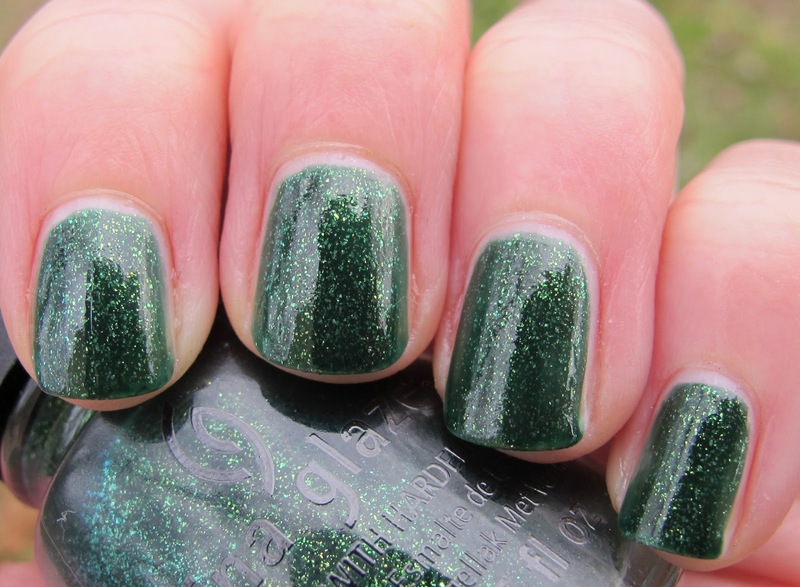 Love Emerald Sparkle still! Peace, Love and Polish- thanks! What are you wearing for the holidays?